Firstly, I just wanted to say a big thank you to everyone who sent a heart-warming message following my last blog post. It really has meant so much and made a difficult time a little bit easier. 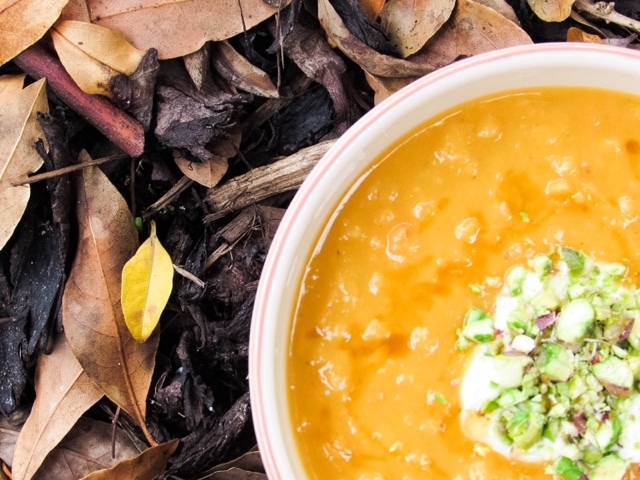 Soup is so perfect in autumn, it's warming, comforting and really good for you too! Isabella and I love cooking up soup together on my days off work, but only if it's orange. I've made endless green soups (with ingredients like broccoli or spinach) and been faced with a turned up nose from Isabella. She's not a fan, so I like to mix up orange coloured ingredients to make tasty soups for us both. 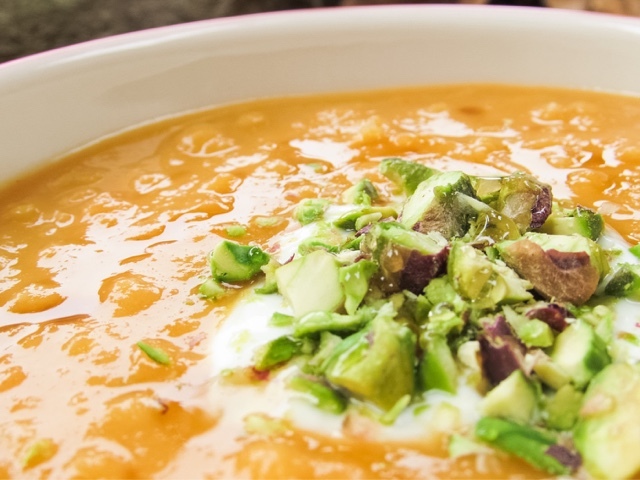 This Sweet Potato and Red Lentil Soup is sweet, creamy and went down a hit with Isabella! 1) Place a large saucepan on a medium heat and add the olive oil. Fry the carrots and parsnips until they are slightly browned. This gives the soup a deeper flavour. 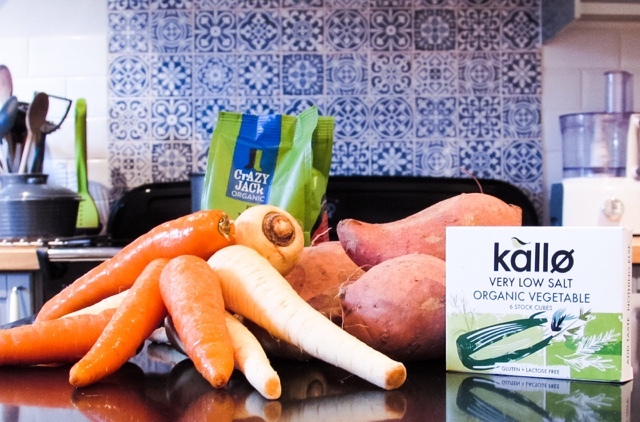 2) Add the sweet potato to the pan and cook for 15 minutes. 3) While the vegetables are cooking put another saucepan on a medium heat and add the 1 cup of lentils and 3 cups of boiling water. Make sure you keep stirring the red lentils while they're cooking. 4) Add enough boiling water to the vegetable saucepan to just cover them. Sprinkle in the stock cube and stir. Cook for 20 minutes, or until the vegetables are completely cooked. 5) Remove the red lentils and vegetables off the heat. Blitz the vegetables until they're smooth, stir in enough black pepper to your tasting. 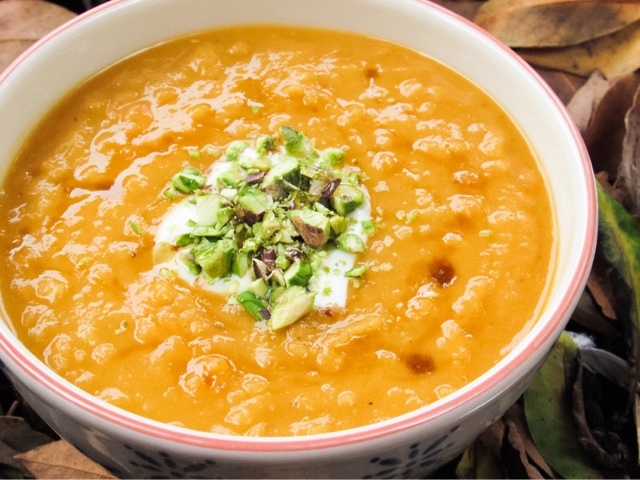 6) Stir in the cooked lentils and serve with a dollop of Greek yogurt, sprinkle of pistachios and drizzle of honey. 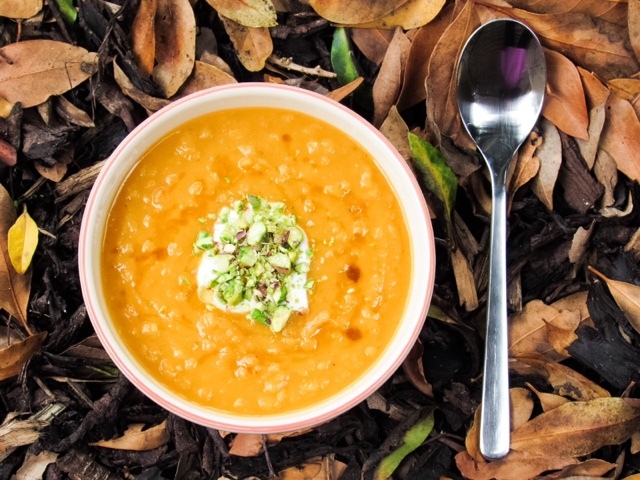 What's your favourite autumn soup?